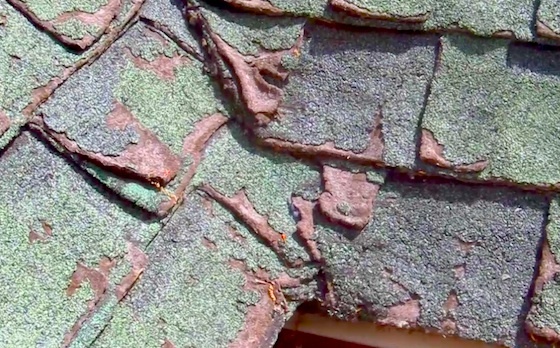 Does your home or business have defective asphalt shingles? I'm talking about ones that failed way before their time. My own 30-year-guarantee asphalt shingles FAILED in just twelve years. I'm trying to assemble stories like yours about shingles failing all across North America. I REALLY need some great photos of your roof if you can somehow take a few. It's easy to attach them below. Your photos will provide more PROOF that this is a widespread issue across the USA and Canada. The following are homeowners like you who have sent me great photos that will HELP solve the problem you're facing. Please fill out the simple survey below to help me. It would be a GREAT HELP if you sent me photos of your roof. Close up ones like you see above are the best. Thank you. By filling out the survey you agree that I can share your story, and any photo(s) you upload, in a report, webpage, book, video, or any other form of communication - even one's not yet invented without giving you any financial compensation. I have to put this in because of the litigious nature of our society. Good grief. Your story, in the long run, should help to put pressure on the shingle manufacturers to begin to make a better product. What city do you live in? I need this to understand your climate. What state or province do you live in? Thanks. Tell me what's wrong with your roof. Give me as many facts as you can. Use this to upload your first photo. I need to see how bad your roof is. This is NOT required, but would be appreciated. Upload a third photo if you want.